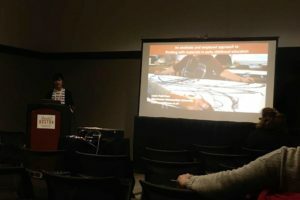 On March 14-16, Dr Laura Trafí-Prats, Senior Lecturer in the School of Childhood, Youth and Education Studies at Manchester Metropolitan University and a member of ESRI, attended the National Art Education Association (NAEA) Convention in Boston, USA. The NAEA was founded in 1947, and it is the only professional association in the USA exclusively dedicated to art educators. Its membership is large and composed of art teachers, representatives of higher education art programmes, museums, art organizations, artists and art education students, predominantly from the USA but also from Canada and countries in Europe, South America and Asia. The conference included more than 1000 sessions, comprising papers, panels, workshops, interactive sessions, and keynote lectures. The latter featured Professor Howard Gardner, writer of Multiple Intelligences, and artist Amy Sherald, who painted the now famous portrait of Michelle Obama, among other artists and scholars from Massachusetts. Laura presented two papers. The first one was in a seminar for the Research in Art Education Interest Group, and within a panel titled New Materialisms and the Reclamation of Language in Children’s Drawing. Other speakers on this panel were Christopher Schulte (Penn State University), and Christine Marmé Thompson (Penn State University – Emerita). The panel looked at recent research on the role of language in children’s drawing, with specific attention given to everyday practices where drawing is embedded in the dynamics of language as representation and generative excess. 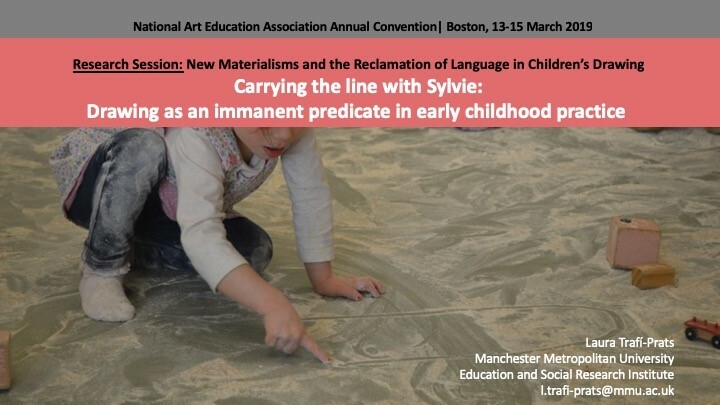 The paper that Laura delivered as part of this panel was titled Carrying the line with Sylvie: Drawing as an immanent predicate in early childhood practice. In this paper, Laura examined the powerful persistence of logocentric practices in the uses of drawing in early childhood education, where children’s drawings come to matter by using them as a platform to produce words, sentences, narratives, and symbols. She argued that such an approach presupposed that drawing begins with an individual intentional child, who in the course of being educated, learns to use language as a way of putting order in his expressive a-representational manners through naming and declaring (MacLure, 2016). This view of the child as commanded by language displaces a materialist conception of drawing as a thinking that shapes in the process of making where accidents, unplanned, non-intentional marks can be lines of flight and the origin of new concepts and thoughts (Deleuze, 2003). This is a thinking of drawing that rather than depending on ideas, intentions and languages resides in the body, sentience and actual and virtual lines of becoming (Ingold 2013; see also Atkinson 2018). Using a theoretical framework inspired by Deleuzo-Guattarian and new empiricist theories, the paper proceeded to discuss the emergence and development of different classroom performances associated to drawing and connected to a three year old, Sylvie. 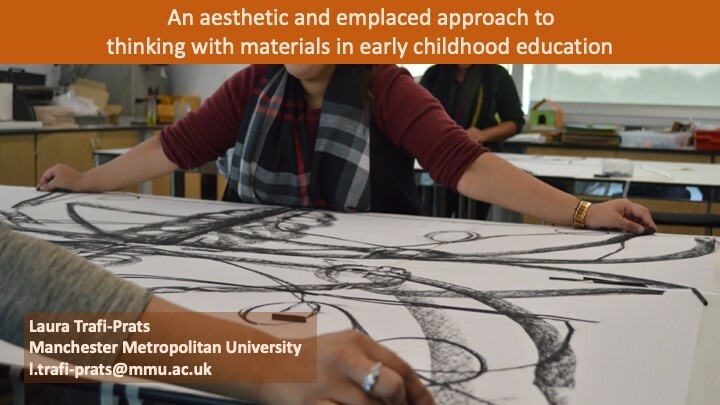 The second paper was presented at the Early Childhood Art Educators Interest Group and was titled An Aesthetic and Emplaced Approach to Thinking with Materials in Early Childhood Education. Taking as inspiration a unit that Laura has designed and taught for the first time this year in the Early Years and Childhood Studies Programme at Manchester Metropolitan, Laura outlined and discussed a curriculum for early childhood educators centred on thinking with materials through places in the community (such as museums, gardens, artist studios and makers labs). She discussed how these places can become important assets for young educators who seek to involve children in material, aesthetic and sensuous forms of learning while confronting a lack of resources and professional support in their own centres.